Due to a tip from @DougDeMuro (is that guy ever not shopping for another car? ), I found GR Autogallery. 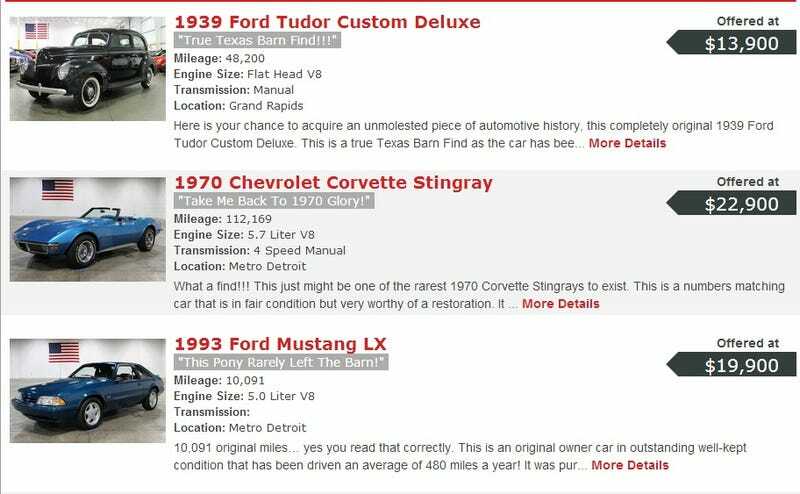 I destroyed most of my morning productivity browsing their inventory, but even better than GR's selection of rides...is the sub-titles they use to describe the cars. MANUAL TRANSMISSION! That isn't "fairly awesome" that is really awesome! "This Fairlane 500 Hardtop Sport Coupe is in excellent condition sitting in vintage burgundy factory color with tan vinyl interior. It is a comfortable driver with bucket front seats and a center console. It's powered by a period correct 289ci V8 paired with a 4-speed manual transmission. It features dual exhaust, original radio, 4-speed Hurst shifter, and Cragar wheels. This car is a good smooth driver and a lot of fun to be behind the wheel in. With plenty of curb appeal and a great color combination, this is an affordable classic that is really cool. " Now tell me you wouldn't yell "TRANS AM RAM!" doing a burnout from a stop-light. "This is a one owner car that has spent most of its life in California. It features the original engine paired with the top option 6-speed Hurst manual transmission. It features a Monsoon 500 watt 10-speaker sound system, t-tops, cruise control, power seats, pop up headlights, power 4-wheel disc brakes, power windows, and traction control. This car has always been well maintained and is in excellent condition. It's a really fun car to drive that looks great with black on black. Have a muscle car with modern technology." Let's go racing.....yes...let's do that. "Turbocharged track car… sounds like a fun way to spend a Saturday right? GR Auto Gallery is pleased to present this one of a kind 944 Turbo track car. Built in Neckarsulm, Germany, it was originally sold new at Champion Motors Porsche Audi in Pompano Beach, Florida on 2/12/88 for $37,000 which would be $75,000 in 2014 dollars! After being enjoyed for a few years, it was then transformed into a weekend race car and equipped with a full roll cage, aluminum racing seats with 5-point harnesses, and racing spec tires. Further upgrades over the years include Lindsey Racing engine upgrades totaling over $7,500 and additional upgrades from Catellus Engineering totaling over $3,000. There are pages upon pages of documentation for this vehicle from 1988 through 2014 with receipts totaling over $110,000 invested into this slick, track ripping, Harm Lagaay designed, internally coded 951 Porsche." It's the affordable muscle car for EVERYONE! And Le Mans is this weekend, why haven't you bought this car yet? "The Lemans GT first known as a GT-37 option package in 1971 was a marketing ploy by Pontiac to make an affordable muscle car for everyone. In Fact the marketing slogan was "There's a little GTO in every GT-37-and you don't have to be over 30 to afford one". In fact if you got the stripped down GT-37 with a 455 under the hood it was in fact, a GTO Killer. This didn't sit well with GTO owners and led to the T-37's quick disappearance. Or did it? The car actually became known just as the GT for 1972 and could be ordered with any engine option as well. It also included white letter tires, body colored mirrors, rally stripes, dual exhaust and GT decal identification." Since I work mostly with new and lightly pre-owned cars, I'm not a great judge on whether or not these cars are NPOCP. So I will now let you ruin your productivity today and post your favorites in the comments.